Varanasi is a city situated on the banks of the River Ganges in the Indian state of Uttar Pradesh, 320 Kms southeast of state capital Lucknow. It is regarded as a holy city by Hindus, Buddhists and Jains. It is one of the Olddest continuously inhabited cities in the world and probably the oldest in India. the city was founded by the Hindu deity, Lord Shiva, several thousand years ago, thus making it one of the most important pilgrimage destinations in the country. It is one of the seven sacred cities of the Hindus. Many Hindu scriptures, including the Rigveda, Skanda Purana, the Ramayana, and the Mahabharata, mention the city. Varanasi is generally believed to be about several thousand years old. Varanasi was a industry centre famous for its muslin and silk fabrics, perfumes, ivory works, and sculpture. During the time of Gautama Buddha (born circa 567 BCE), Varanasi was the capital of the Kingdom of Kashi. The celebrated Chinese traveller, Xuanzang, attested that the city was a center of religious and artistic activities, and that it extended for about 5 km along the western bank of the Ganges. Jantar Mantar is an observatory built by Maharaja Jai Singh, of Jaipur in the year 1737 is situated close to the Dashashwamedh Ghat, overlooking the ghats on the Ganges. Jai Singh was a great admirer of science and technology and he was particularly passionate about astronomy. Before the commencement of construction (of observatories) he sent scholars abroad to study the foreign observatories. The emissaries returned with many manuals on astronomy. The Jantar Mantar at Varanasi was built in line with Delhi, Mathura, Ujjain and Jaipur observatories. Bharat Kala Bhavan, located inside the BHU campus, is an art and architecture museum and houses a vast collection of paintings, Hindu and Buddhist sculptures and other materials of archaeological importance. The Bharat Kala Bhavan was established in the year 1920 A.D. by Raj Krishndas. In the main hall of the Bharat Kala Bhawan, there is a figure of a man standing on one leg and one hand on his hip and lifting a mass of stone above his head, with one hand. The figure is said to be of Lord Krishna, lifting Mount Govardhana. Many images in the Bharat Kala Bhavan confirm to the existence of Krishna cult in Kashi in 15th and 16th century. The Ramnagar Fort lies about 14 km. from Varanasi and is situated on the opposite bank of river Ganges. It is the ancestral home of the Maharaja of Banaras. Maharaja Balwant Singh built this fort-palace in the eighteenth century. The fort is built in red sandstone. The Ramnagar fort has a temple and a museum within the grounds and the temple is dedicated to Ved Vyasa, who wrote Mahabharata, the great Indian epic. Legends have it that Ved Vyasa stayed here for a brief period. 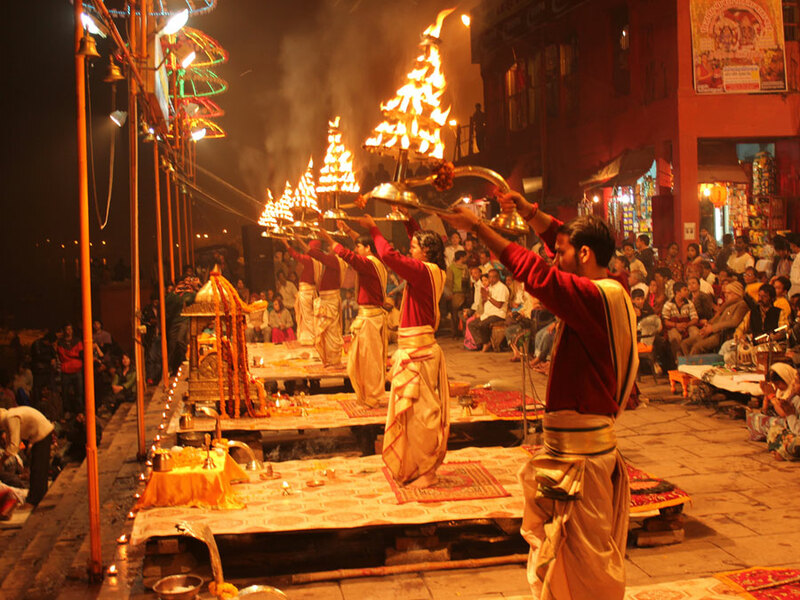 A festive experience like none other awaits you at Ganga Festival at Varanasi. Celebrated in the month of November-December is the sacred day, when the ghats of Varanasi come alive with thousands of brightly-lit earthern lamps. This festival is celebrated with pomp and gaiety in Sarnath. This day Lord Buddha was born. A large fair is held in Sarnath and the relics of Buddha are taken out in a procession for public viewing on this day. Buddh Purnima is celebrated during the month of May. Varanasi railway station is well conneted with Delhi, Calcutta, Mumbai and all major cities of India. Varanasi is well connected by road to all major cities of Uttar Pradesh.